1 THE CHOICE OF SUPERMOTARD! 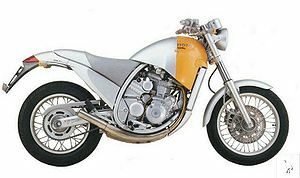 An enthusiastic proposal, born to acquire the characteristics of a continuously increasing segment, the one of versatile supermotard; a motorbike able to attract youngster’s attention with sport spirit in their veins but who also do not want to resign from the ductility of an “enduristic” riding style. Aprilia, as attentive as always to fashions and the market, has decided to attack the small capacity Supermotard segment. The first offering in this sense was the MX 50, now followed by the bigger 125 cc version. The MX 125 Supermotard is a slick, agile, easy-to-handle, dynamic, fast and extremely appealing bike. It follows the latest trends in the Supermotard bikes, and is ideal for everyday use. The MX 125 is perfect for a wide range of uses, featuring high performance and is never caught off-guard in any situation. In fact, a motorbike such as the MX 125 perfectly combines the professional essentials of a “real” motorbike with the urban mobility needs of dynamic young riders, without compromising on the “hard” ride, cultivating the passion of the “motards” and the chance to learn the riding techniques of the champions in this speciality. All clearly with the safety of the high level technical components that define the 125 cc Aprilia motorbike. Thanks to the power provided by the Aprilia single-cylinder, 2-stroke 125 cc racing-derived engine, the MX 125 is a machine that “eats the elbows”, putting bikes with a more sporting design and higher power in difficulty on mixed routes. The APRILIA MX 125 is therefore destined to become the king of the elbows, in the hills or in the mountains, thanks to its top performance and the handling and ridability of a sporting motorbike. Yet this won’t stop its young purchaser from using it to go to school or go out with friends, even with the girlfriend comfortably on the back, thanks to the approval for transporting passengers. The reactivity of the ride and the feline sprint of the “Sport Production” derived two-stroke engine make the Aprilia Supermotard a perfect “take off” bike at the lights, with complete peace of mind, thanks to the suspension, brakes and tyres worthy of a larger capacity motorbike, making the bike extremely safe and comfortable in all the hazards that lurk on city roads. Paving stones, manhole covers, train tracks and holes can be faced on the MX 125 with double the safety of the normal scooter usually used around the town. All, naturally, “sauced up” by a line designed based on the most modern style concepts of the Supermotard speciality, but with the ever present mark of the Aprilia personality, which has always brought to each of the segments it operates in an unmistakeable and often indelible sign of its style, with genial and innovative ideas. Supermotard means safe fun and an authentic riding feeling. Aprilia interprets this philosophy, shared by the young, true motorcycling enthusiasts, to perfection. The MX 125 puts these concepts on the road. Significant work has been done in terms of aesthetics by the APRILIA designers, who have especially created a brand-new front section for the MX 125, made up of the new generation mudguard, front fairing and transparent headlight; the ducts, the side panels, the plate holder and the smaller and better connected rear headlight, the aluminium handlebars and the modern digital dashboard. 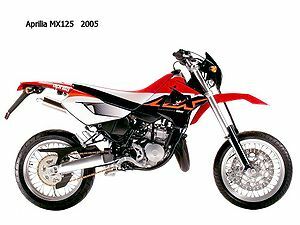 The MX 125 is a true supermotard, as demonstrated by its trim and the riding position; the saddle, the footrests (widened for better grip), the suspension, the brakes and the 17” spoke wheels make the MX 125 a winning supermotard. The braking system on the APRILIA Supermotard is extremely powerful for a 125 cc bike: a 320 mm front disk with floating two-pot calliper, and a 220 mm rear disk, also with floating calliper. The 40 mm upside-down telescopic fork features a wheel travel of 260 mm. The rear end features an adjustable single hydraulic shock absorber with piggy back (able to guarantee uniform operation); the wheel travel is 280 mm. The main technical development in the creation of the Supermotard involves the wheels. In the case of the MX 125, the new components include aluminium spoke rims, 3.00” x 17 at the front and 4.25 x 17 at the rear. As a consequence, the tyres chosen are the large 110/70-17” and 150/60-17” road wheels, on the front and rear respectively. The MX 125 engine is well known to 125 cc bike enthusiasts and experts, the superlative APRILIA liquid cooled engine, with balancing countershaft. The cylinder has a nickel and silicon carbide coating, which can deliver high power while ensuring long piston life. The exhaust is made from stainless steel, with built-in catalytic converter. An “absorption” type stainless steel silencer is used, for better noise abatement. All naturally in compliance with the upcoming Euro 2 emission standards. Lubrication is managed separately using a mixer. No corners have been cut in terms of the dashboard, confirming the desire to create a versatile and practical bike for everyday use: the MX 125 digital dash features a new, innovative design, with all the functions required for the sporting use of the bike, and not only. Instant speed, maximum speed (recorded), average speed, odometer, trip time, lap time, clock, flat battery signal, oil in the mixer in reserve warning, service request signal. All this plus the 5 lights for the blinkers, neutral gear, low beam, high beam and the engine temperature/oil level. The APRILIA MX 125 is dedicated to today’s sixteen year olds, for whom the scooter is no longer exciting, lovers of the motorbike and the sporting ride, but who find the exciting 125 sporting road bikes uncomfortable and a little impractical. A versatile, high performance Supermotard, yet sleek and light for everyday use. Quality, performance, advanced components and an appealing design are the keywords that describe this Aprilia Supermotard. Clutch Multiple disks in oil bath. This page was last edited on 23 January 2011, at 01:49.